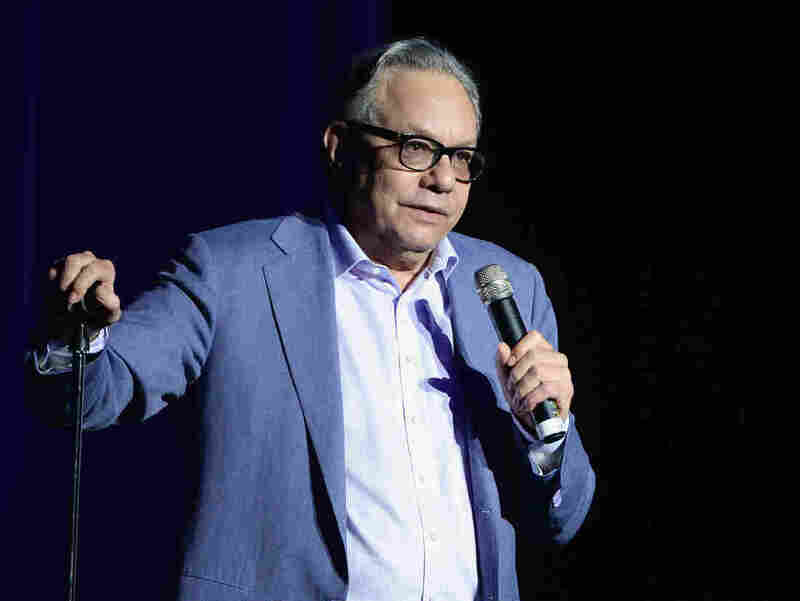 Anger And Aggression In Animals And Humans : Shots - Health News Scientists say comedian Lewis Black has a lot in common with fruit flies. They're both really good at acting angry, probably because human anger has roots in animal aggression. For comedian Lewis Black, anger is a job. Black is famous for his rants about stuff he finds annoying or unfair or just plain infuriating. Onstage, he often looks ready for a fight. He leans forward. He shouts. He stabs the air with an index finger, or a middle finger. To a scientist, Black looks a lot like a belligerent dog, or an irritated gerbil. "Practically every sexually reproducing, multicellular animal shows aggressive behavior," says David Anderson, a professor of biology at Caltech and co-author of the book The Neuroscience of Emotion. "Fruit flies show aggression." When I relay that last bit to Black, he's skeptical. "Really?" he says. "Come on." But Anderson, whose lab studies fruit flies, says the evidence is compelling. "They fight over females, they fight over food, they threaten each other, they put their wings up in the air, they charge at each other," he says. But does aggressive behavior mean a fruit fly gets angry the way Black does? Anderson says that depends on how you define the term. "We use anger subjectively to refer to our experience, our conscious experience, of rage, the feeling that you are about to explode, the feeling of irritation," he says. Black feels that way a lot. And he has spent decades thinking about how anger works in his own brain. "My anger comes from a collection of things that occur during the course of a day that build up," he says. "So by the end of a day, six or seven things have happened to me that have gone into my anger bank." "What anger is good for, too, is to generate energy to move on, to figure out how to do something," comedian and anger artist Lewis Black says. "You get angry and go, what do we do?" What kinds of things? During an hourlong conversation, Black offers a sampler: "Idiotic debates that go on in Congress, health care, your cable provider, chemicals that we allow to be dumped, sensitivity training, the president, the Iraq War, exercise." Animals presumably have other triggers. And, of course, there's no way to know for sure how an animal is feeling. So Anderson and other scientists focus on animals' behavior and on biological changes like heart rate, hormone levels and brain activity. By those measures, Anderson says, there is strong evidence that animals experience some sort of internal state that drives their aggressive behavior. "I'm comfortable calling that state anger as long as we are clear that we're not [referring] to the subjective feeling," he says. Research also shows that aggressive behavior is remarkably consistent across species, Anderson says. For example, both animals and people may take out their aggression on innocent bystanders. Anderson says his cat does this. "It can be staring out the window when a neighborhood cat strolls by," he says. "Its back arches, it hisses, its tail goes up and it turns around and attacks my other cat who's been sitting placidly by minding her own business." That sort of behavior suggests animals generalize their anger much the way people do, Anderson says. And experiments show that the internal state can persist long after the event that caused it is gone. For example, it's easy to provoke a state of aggressive arousal in an adult male fish by showing it another threatening male, Anderson says. Then, even after the threat has been removed, the adult male will continue to attack young fish in the tank that it ordinarily ignores. Generalizing and maintaining an angry state is familiar territory for Black. After a day banking irritation, he says, he is ready to be onstage "yelling about something that has nothing to do with my phone service or my cable carrier, my cable provider." Both Anderson and Black say expressing anger can be useful. For Black, it's a matter of maintaining his internal balance. "I have the best blood pressure of anybody I know," he says. "And I think it has to do with the fact that I've spent a lot of my life yelling and screaming about things onstage." He may be right — to a point. There's evidence that expressing anger can reduce levels of stress hormones. On the other hand, there's also evidence that extreme outbursts may trigger a heart attack. And, of course, being on the receiving end of this emotion can hurt. But for Black, anger is a powerful motivator. "What anger is good for, too, is to generate energy to move on, to figure out how to do something," he says. "You get angry and go, what do we do?" Anger appears to play a similar role in the animal world, Anderson says. For example, an aggressive response can help a creature survive if it's attacked or robbed. "If a squirrel steals a nut from another squirrel, there's an adaptive value to arousing the squirrel who was the victim of the theft and having it chase at the other squirrel and beat him up and try to recover his nut," Anderson says. In both animals and people, Anderson says, aggressive behavior tends to be associated with similar physical responses like a racing pulse, higher blood pressure and elevated levels of hormones such as testosterone. And he says the similarities in both behavior and biological responses raise a question about brain evolution and aggression. "You look at dogs fighting, you look at fish fighting, you look at flies fighting, you look at people fighting," he says. "Is that because they're all using the same basic brain mechanisms and brain chemicals?" There is a working theory that because aggression is so common and because it's more than a reflexive response, the inner state that goes with aggression must be common too. If so, that suggests the potential for anger is something we're born with. There's an ongoing debate among scientists about whether that's true. Psychologist Lisa Feldman Barrett of Northeastern University is among the researchers who contend that human emotions including anger are "constructed" rather than hard-wired in the brain. But Anderson believes that many behavioral responses and the internal states associated with them are innate and form "the evolutionary underpinnings of emotional behavior." Marcel Just, a neuroscientist at Carnegie Mellon University in Pittsburgh, also thinks there is a strong biological component to anger and other emotions. Just is one of the few scientists who have actually studied anger in human brains. And what he found was surprising. "Everybody's anger feels very personal," he says. "But in fact if you and I were both in an MRI scanner and measured the activation, the pattern would be rather similar." Just was part of a team that trained a computer to recognize the brain activity associated with emotions in people. And a study showed that it was able to identify anger most of the time and to differentiate that emotion from others, like disgust. 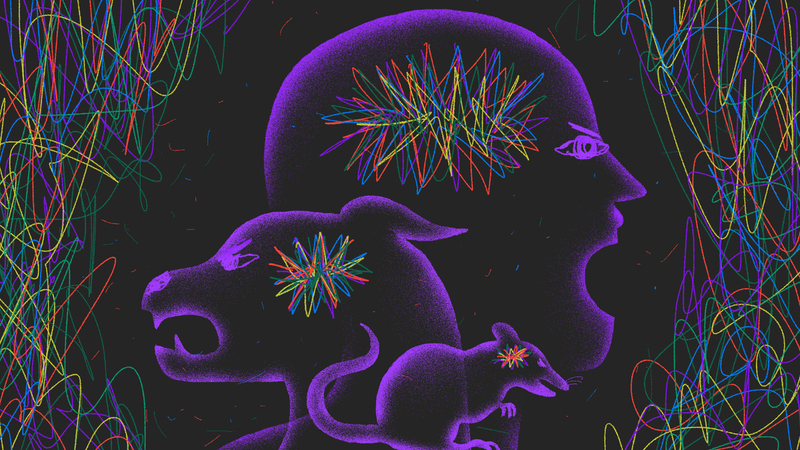 One way the human brain may differ from an animal's is in the circuits used to control emotions, including anger, Just says. He thinks our ability to use these circuits probably depends more on nurture than nature. "One of the things that we learn from our families, from our parents, from teachers is how to deal with our various emotions and most particularly anger," he says. Black has spent much of his life learning how to deal with his anger. And he understands why the emotion has such a bad reputation. "It's where it leads to that's gotten its rap," he says. "Disgust? You may lose a friend. Anger? You could kill a friend." So Black says when he is performing, he often finds himself trying to make sure an audience doesn't get too angry. And if he finds out his flight home has been delayed, he stays calm. "Here's a million-dollar tip," he says. "You sit on that anger, and you just empathize with the person whose job it is to deal with you."